Preheat oven to 350º F. Prepare five 8-inch round cake pans, and one 9 inch square baking dish with a lining of parchment paper, and nonstick baking spray. Combine the melted butter, sugar, and vanilla in a large bowl. Beat in the eggs, one at a time, mixing well after each, until thoroughly blended. Sift the flour, cocoa powder, and salt in a bowl. Gradually stir flour mixture into the egg mixture until blended. Stir in the chocolate chips. Spread the 1/3 of the batter evenly into 2 of the 8 inch baking pans, and pour the rest into the 9 inch square baking pan. Bake in preheated oven until an inserted toothpick comes out clean, about 40 minutes. Remove, and cool pan on wire rack before cutting. While the brownies bake, prepare the white cake batter. Cream the butter until light and fluffy with an electric mixer. Slowly add sugar one cup at a time, making sure to fully incorporate each cup before adding another. Add eggs one at a time, making sure to fully incorporate each egg before adding another. Whisk together flour, baking powder, and salt. Pour the buttermilk and vanilla into measuring cup and whisk together with a fork. Add to butter mixture alternately with milk mixture, beginning and ending with dry ingredients. Gently stir all ingredients until well combined. Stop mixer and scrape down sides of bowl, making sure that all ingredients have fully mixed. Pour equal amounts of cake batter into the remaining 3 cake pans, and place in the oven. Bake for 25-30 minutes, or until a toothpick inserted in the center comes out clean. Remove and allow to cool slightly in cake pans for about 5 minutes, then cool completely on a wire rack. While the cakes bake and cool, prepare the frosting. Whip the butter until it is light and fluffy, then slowly add the powdered sugar. Alternate installments of powdered sugar with heavy cream, and continue mixing until the frosting has reached desired consistency. Add salt and vanilla, and continue mixing until fully incorporated. Then stir in the crushed Oreos. 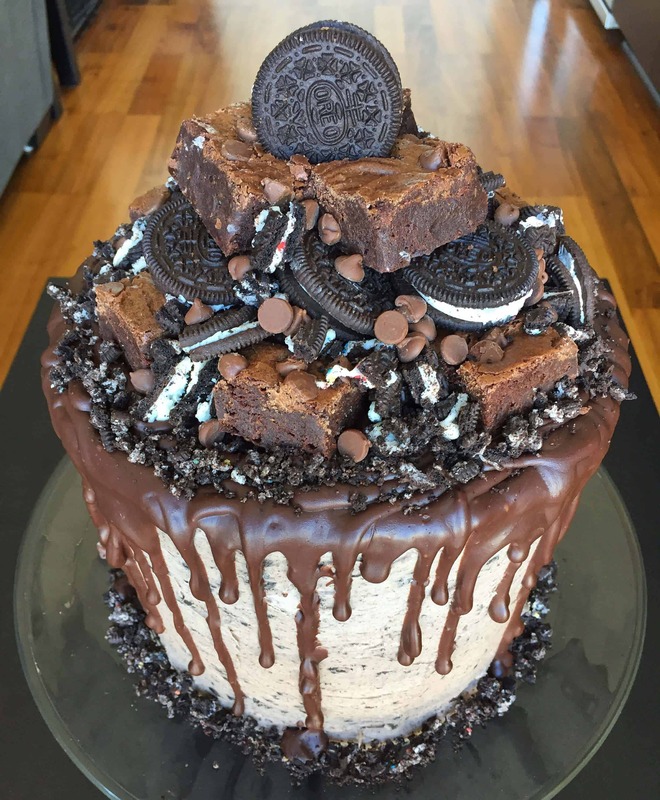 Continue to mix at a high speed until the Oreos are fully incorporated throughout the frosting. Once the cakes and brownies are fully cooled, assemble the cake. To make the cake, alternate vanilla cake layers with brownie layers, slathering an even layer of frosting between the cake and brownie levels. 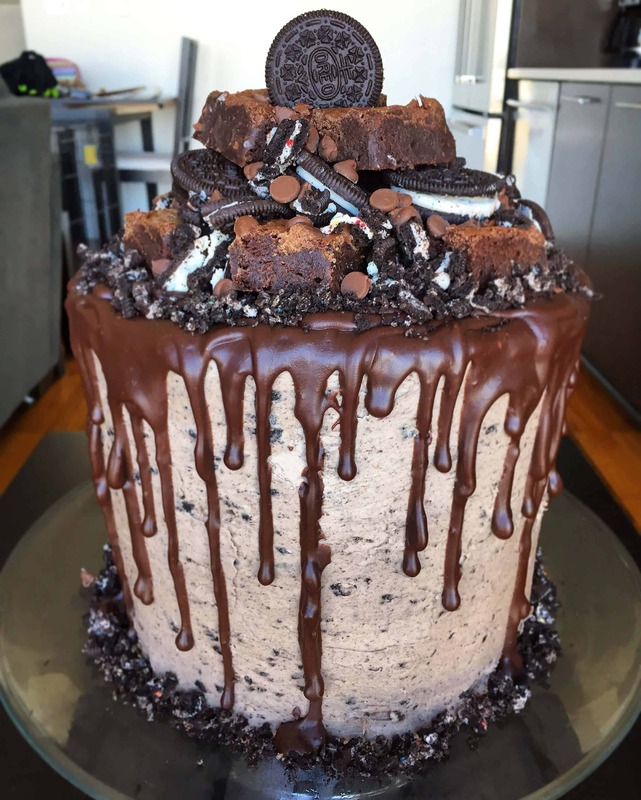 I also chose to sprinkle chopped up oreos between the the layers. Once all the cake and brownie layers are stacked, coat the exterior of the cake with a thin crumb coat. Place in the freezer for about 15 minutes, until the crumb coat is firm. While waiting, prepare the ganache. Heat the cream in a microwave-safe bowl for about 45 seconds, until it is just beginning to bubble. Pour in the chocolate chips, and wiggle the bowl until the chips are completed covered. Let sit for two minutes. Stir gentle, until the chocolate in fully melted and incorporated in the cream. Place in the fridge to allow the ganache to cool too room temperature. Remove the cake from the freezer, and apply another layer of buttercream. Frost until smooth using an offset spatula or cake bench. Push some additional crushed around the base of the cake. Place in the freezer again to allow the frosting to set. woah! Five layers?! That’s amazing! Hi. I’m interested in this cake for 5/2 . Is it possible? Unfortunately I’m booked until the beginning of June, I’m so sorry!! 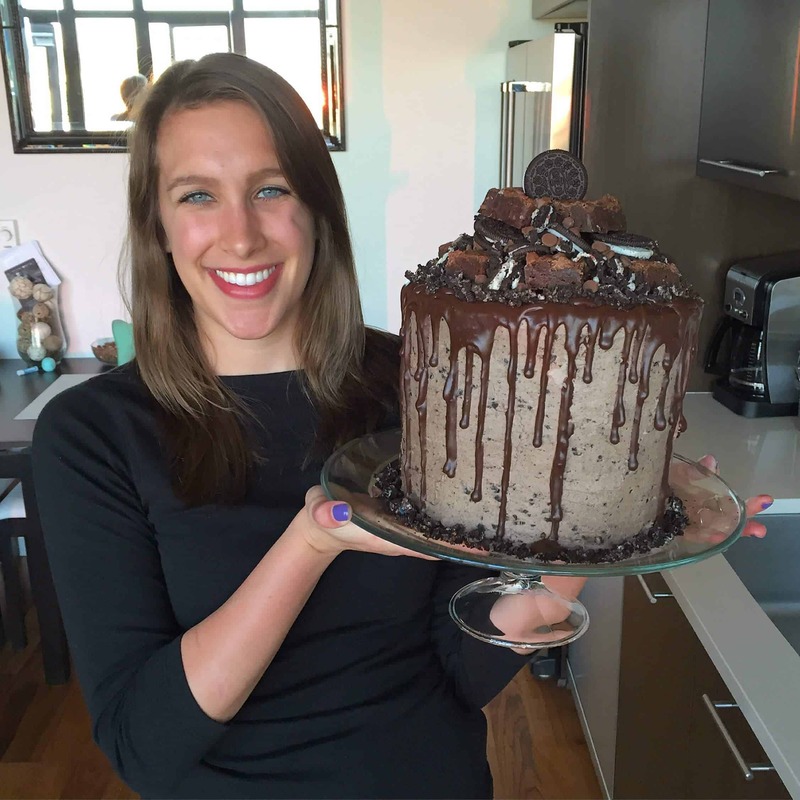 Am I reading on your five layer brownie Oreo cake four and a half cups of sugar .